When a top secret mission goes wrong in Russia and more than half of SEAL Team Nine is killed, the survivors are ordered to scatter and go dark. Only not everyone is willing to let them stay off the grid. Reporter Brittany Blake can smell a government cover up a mile away and since this one involves her missing – possibly dead – brother, she’s not about to let it rest until she discovers the truth. I really struggled with rating Off the Grid. On the one hand, Monica McCarty’s writing is engaging, drawing me into the book and keeping the story moving at a quick clip. The action is cinematic and the overarching series question of who betrayed SEAL Team Nine and why was interesting. That being said, I struggled with the characters which kept me from liking this book as much as I wanted to. Brittany Blake gave me flashbacks to Lois Lane (always a good thing). She’s a reporter with a sharp mind and dogged determination to get her story. She has been wronged more than once by a government cover up and her brother is one of the missing SEALs, so I did understand why she was so determined to find out what happened to the group of men she dubbed “The Lost Platoon.” That being said, Brittany’s strengths were also her weaknesses. She can get tunnel vision, which is frustrating when she doesn’t seem to fully understand – or more importantly care – that she’s putting other lives in danger besides her own. One of those lives belongs to John Donovan, the man who broke her heart five years ago. John is known for his laid-back ways, but he’s mostly intense and frustrated in this book. He definitely has reason to be, but at times it felt like his personality had melted away and we were left with a generic military hero, which was a pity. John and Brittany do have chemistry, but their romance paled in comparison to the sexual tension between two supporting characters. Added to that, Brittany and John suffer from the same problem that a lot of characters in this book do: a lack of honest communication. It’s a common enough plot device, but it’s one that I find a bit frustrating, so people who aren’t bothered by this may like their romance more than I did. Off the Grid isn’t just John and Brittany’s story. 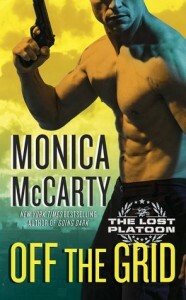 Former SEAL Colt and his ex-wife, CIA analyst Kate are working to discover who betrayed Colt’s former team. Colt and Kate are the reason I am so invested in this series. Their chemistry is off-the-charts explosive and the pure drama keeps me coming back for more. The pain, anger, distrust, and lust practically jump off the page and I cannot wait to see if/how Ms. McCarty makes things work for these two. She definitely has her work cut out for her, because even though I got a fair sense of Colt’s history and why he acts the way he does, he definitely is cruel to Kate; so much so that I’m honestly not sure if I should be rooting for him to win her back. Whether or not he does, he and Kate livened up the book and their storyline ensures that I’ll be back for Out of Time, the next Lost Platoon book.